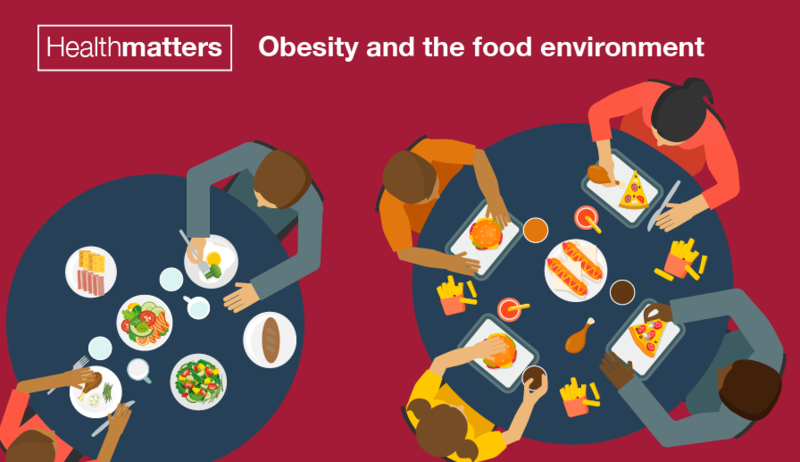 Welcome to the latest edition of Health Matters, a resource for local authorities and health professionals, which focuses on obesity and the food environment. Obesity is not just a local or national concern but a global one. Nearly two thirds of adults (63%) in England were classed as being overweight (a body mass index BMI of over 25) or obese (a BMI of over 30) in 2015. Nearly a third of children aged 2 to 15 are overweight or obese and younger generations are becoming obese at earlier ages and staying obese into adulthood. Failing to address the challenge posed by the obesity epidemic will place an even greater burden on NHS resources. 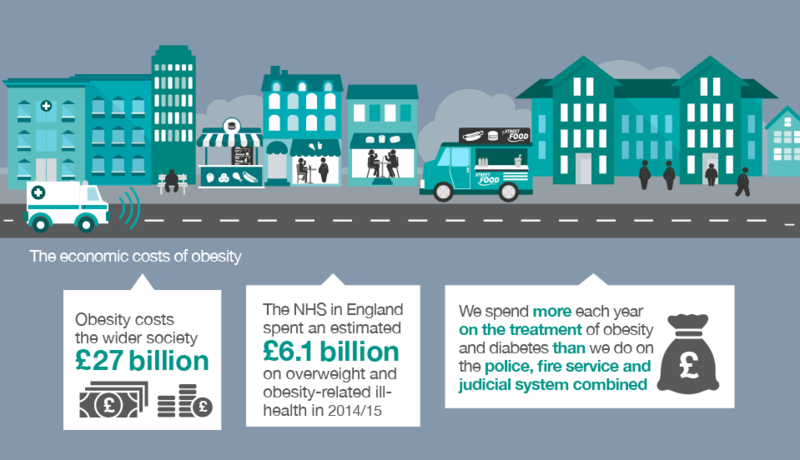 It's estimated that the NHS spent £6.1 billion on overweight and obesity-related ill-health in 2014 to 15. More broadly, obesity has a serious impact on economic development. The overall cost of obesity to the wider society is estimated at £27 billion. But there is no silver bullet for tackling obesity. Its causes are complex with many drivers including behaviour, environment, biology and physiology and culture. The vast majority of people know that eating a healthy diet, as well as being physically active is good for them and will help to prevent weight gain, but for many people it can be a real struggle to put this into practice. This is primarily because we are living in an obesogenic environment that encourages us to eat too many calories and not be physically active. PHE estimated in 2014 that there are over 50,000 fast food and takeaway outlets, in England. On average, there are more fast food outlets in deprived areas than in more affluent areas. And the increasing consumption of meals out of the home or takeaways has been identified as an important factor contributing to rising levels of obesity. More than a quarter of adults and one fifth of children eat food from outlets such as cafes, takeaways or restaurants at least once a week. These meals can be high in calories, fat, sugar and salt. We need to support children and their families to make healthier choices and we all want to help make the healthier choice to be the easy choice. But often healthy choices are hard to find on menus. This latest edition of Health Matters explores how we can fundamentally change the food environment so that the healthier choice becomes the default thereby supporting children and their families to improve their diets. Influencing the food environment so that healthier options are accessible, available and affordable can only be accomplished through a collaborative approach, effective partnerships and co-ordinated action at a national and also at a local level across the public, private and voluntary sectors. Councils have key opportunities to act out and lead improvements. Local councils and food businesses (such as fast food takeaways, restaurants, cafes, mobile food vendors, market stalls, corner shops, convenience stores, leisure centres and children’s centres) have great influence over the lives of their local community. There are many examples of councils working with outlets to create a healthier food environment. By working together and in partnership with the local community local councils can go further to positively influence the food environment, to promote and make healthier food choices, enabling us all to live healthier lives. 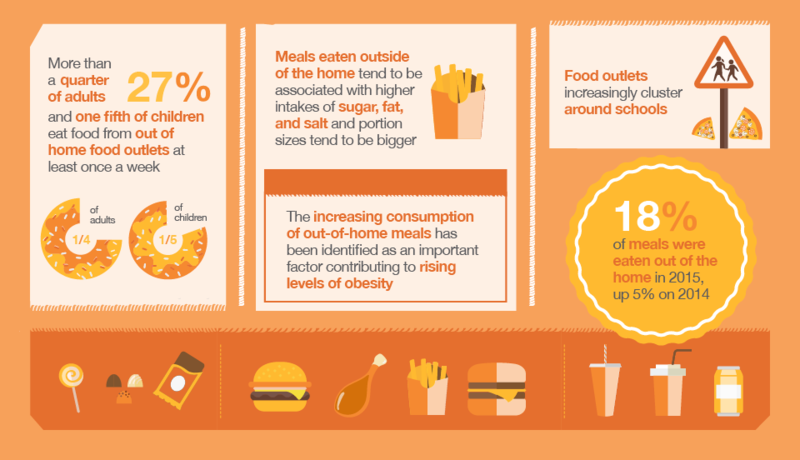 This edition of Health Matters focuses on PHE’s new strategies in the encouraging healthier 'out of home' food provision toolkit which summarises the evidence base, types of interventions, and emerging local practice. It can help those responsible within local councils, to think about how, through working in a systems approach, they might bring together a coalition of partners to improve the food environment. 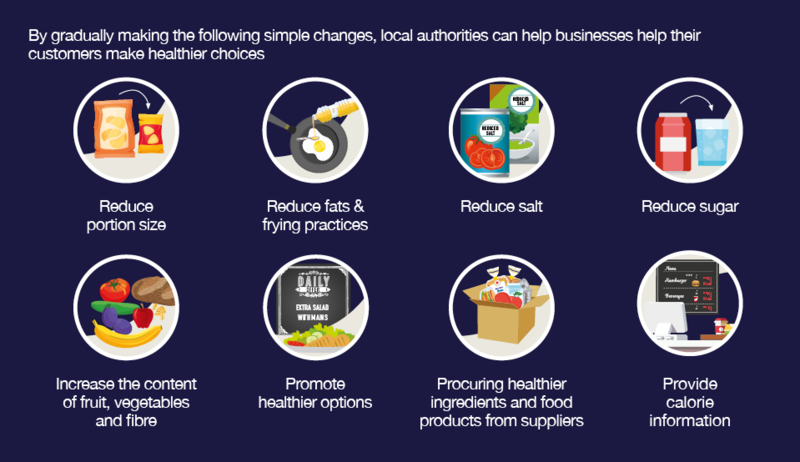 The Healthier catering guidance for different types of business, which accompanies the toolkit, provides tips for business on how to provide and promote healthier food and drink for adults, children and families. The advice describes simple practical changes that different types of businesses can make when procuring, preparing, cooking, serving and promoting food. By improving every day food we can help healthier food become the default choice, improving the quality of life for future generations. Download the infographics and slides available with this edition of Health Matters and use them locally when commissioning or delivering interventions to make food and drink healthier. Health Matters is a resource for professionals which brings together the latest data and evidence; makes the case for effective public health interventions and highlights tools and resources that can facilitate local or national action. Visit the Health Matters area of GOV.UK or sign up to receive the latest updates through our e-bulletin. If you found this blog helpful, please view other Health Matters blogs. How to improve the access to healthy food. That is soooo easy. First of all: make marketing change its behaviour, instead of exposing suggary products on key places at the shops, there should be fruits, veg displayed and other healty options. Secondly create the environment where healthy food is cheaper then junk food, not the other way around. I am sure that's enough. Marketers create population' behaviour not the other way around. As the GP responsible in our practice for combating childhood obesity, I can safely say that television is the biggest contributing factor to obesity, both in the sedentary habits it encourages and the relentless manipulation of our eating habits through programming and advertising. The best antidote to TV watching is READING. Scientific research has shown that reading relaxes, sharpens the brain, helps children sleep better and counteracts the deleterious effect of omnipresent screens on children's mental health. PHE should encourage parents to replace the remote with a book. In order to work with this environment you first need to understand it, the complexity and how all the aspects of the system come together; Simply focusing on the provision of healthy options or healthier businesses is out of date and doesn't work with the economics of the businesses. Sustainable change looking at system dynamics and mechanisms for change is the only realistic solution. As food system strategy specialists we have forged a new whole system approach with our partners at Stockport Council and fundamentally we need to shift both consumption and production patterns to make change. The biggest limitations we find, after working with hundreds of SME food businesses is that around supply chain and employment. The reason we have takeaways is that is the easiest business to make a profit, if we want more artisan businesses producing good food people can afford then you need provide support in a much more fundamental way.